Ethnic cleansing got its start in North America in 1755. 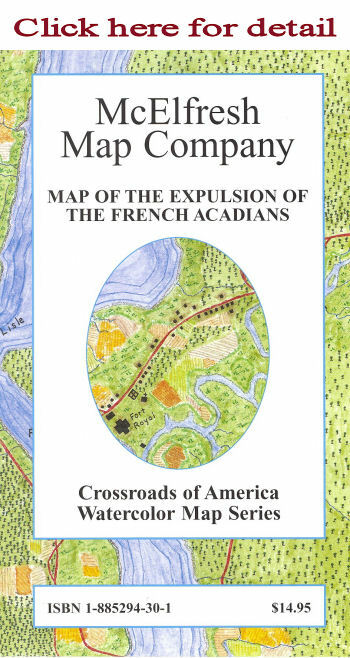 English and Colonial troops systematically transported thousands of Acadians of French origin to numerous alternative destinations. Map Image: 35" x 19"
Overall size: 36" x 23"
Description: This map reconstructs the Acadia of the Expulsion with detail maps depicting the most prominent sights down to the crops and the individual homes. Several sketches recreate the forts and block houses that characterize defenses in these perilous times.